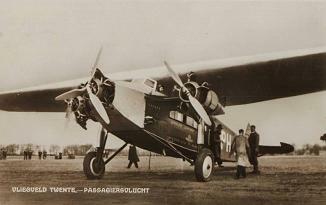 René visited Twente airport once before. 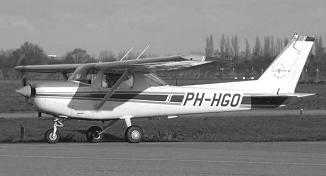 That was on 11 October 1993 with the Cessna 152 PH-HGO, 25 years earlier. 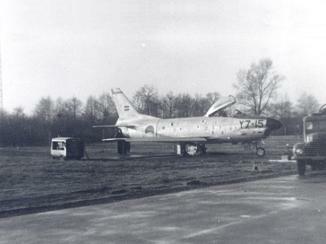 At that time Twente airport was still Airbase Twenthe. 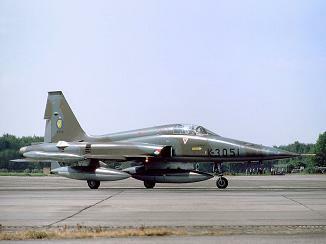 The 315-Squadron that was based at Twenthe was stationed at Villafranca in Italy, taking part in the enforcement of the no-fly zone over Bosnia and Herzegovina during the Bosnian War. A spotters log shows that only one F16 of 323-Squadron visited Air Base Twenthe that day when I visited as well. 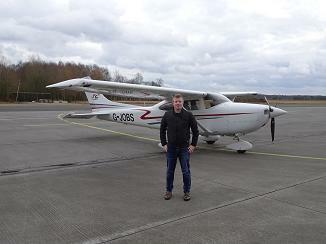 On Saturday 11 March 2018, Jurrian and René visited the former Air Base Twenthe, now Twente Airport, with a Cessna 182T. 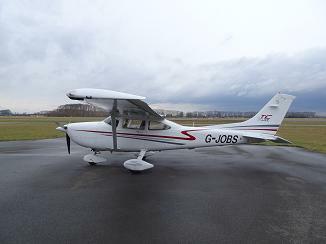 The airplane was at Teuge Airport for scheduled maintenance in the week to come. 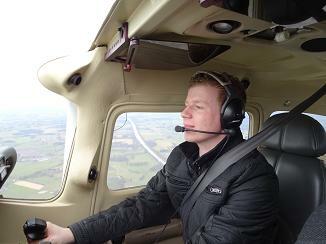 It was only a short flight from Teuge, but it gave the opportunity to get acquainted with this plane. 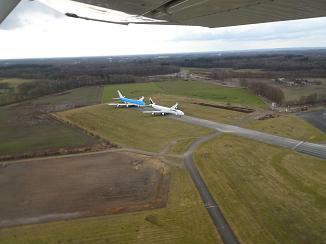 We took-off from Teuge airport runway 26. After leaving the circuit we turned to the east. The distance between Teuge and Twente is 31 NM, and it took us only 10 minutes to reach the circuit. 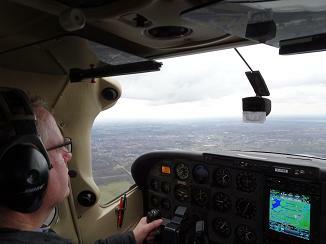 We made a right-hand circuit for runway 23, following a local plane that was doing some training circuits. 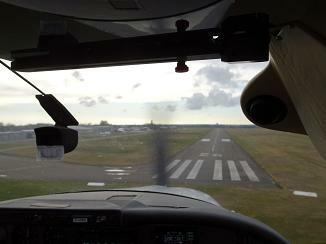 After landing, we taxied to Apron C and to the reporting office to settle the duties. 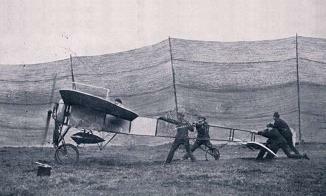 On September 28, 1910, the Twente population became acquainted with aviation when the Belgian aviation pioneer Jan Olieslagers made a half-hour demonstration flight with his Blériot. However, it would take until 1918 before some passenger flights took place in the region on a small scale. 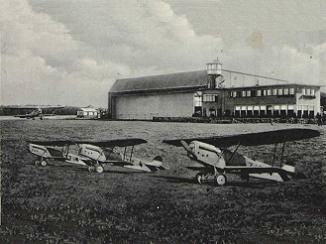 In 1920 there was an airport in the municipality of Oldenzaal. This airport has only existed for two years, because one could not meet the requirements. The territory was from the municipality of Weerselo. The current airport originated in the municipality of Lonneker, on the initiative of a number of Twente industrialists and entrepreneurs. In 1927 the Enschede industrialists came to an agreement with KLM to make part of their moorlands available for the realization of an airport. 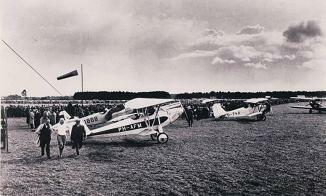 In 1929 a start was made to with the realization of an airfield between Enschede, Hengelo and Oldenzaal, near the village of Lonneker. 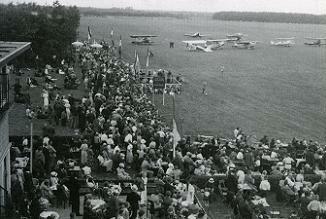 The idea of turning it into a commercial airport resulted in the official opening of Twente Airport by the Mayor of Enschede on 28 August 1931. On Saturday 18 June 1932 the airship Graf Zeppelin landed at the airport, passing from Friedrichshafen to Waalhaven Airport in Rotterdam. 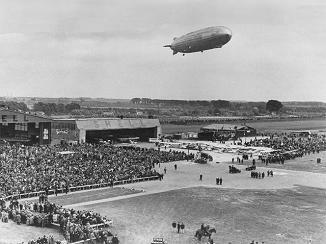 About 50,000 people from the region came to watch the airship at Twente airport. 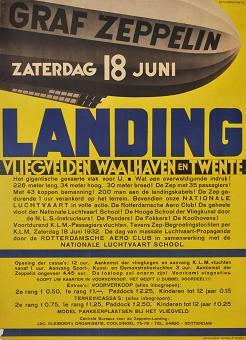 From 1932 there was a daily KLM line service between Twente and Schiphol. This was maintained until the mobilization in 1939. Since 1935 the Twentsche Zweefvlieg Club has been active on the pitch and this club is the oldest user still present. 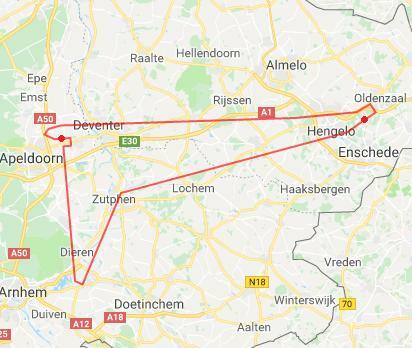 On May 29, 1937, an aviation exhibition was held at the airport, during which scenic flights were made with two aircraft, the Douglas DC-2 Koetilang and the Douglas DC-3 Heron, which reopened the Twente-Amsterdam air line on 1 June of that year. 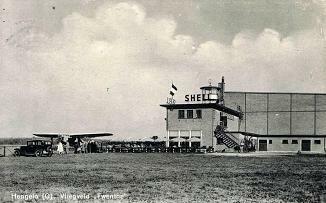 In the years before the Second World war Twente airport was a sleepy airfield. Just before the outbreak of the Second World War in 1939, the government ordered the airport to be dismantled by plowing the grass and digging deep trenches. 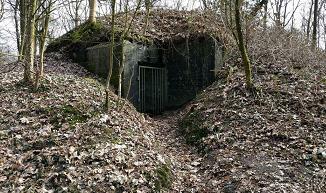 When the Germans invaded the Netherlands, the buildings were blown up by the Dutch army. 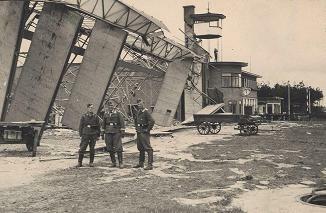 In May 1940 the German Luftwaffe occupied the airport. 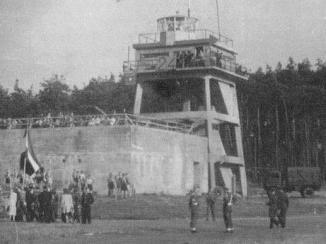 The Germans expanded the airport into a complete and big air base (Fliegerhorst). 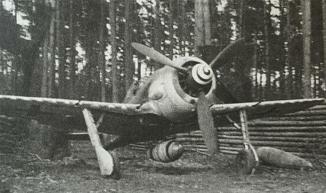 During the occupation, various Luftwaffe units were stationed at Twente, including several Staffels that fell under the IIIe Gruppe of Nachtjagdgeschwader 1 (III./NJG 1). This part flew with the two-engine Messerschmitt Bf 110 . 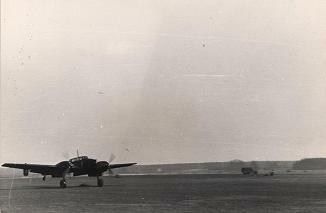 The Germans laid three runways: 06-24, 11-29 and 16-34. The latter was still in use until the beginning of the 1950s, but was later only used as a taxiway. In the woods surrounding the airport and on the Hof Espelo estate, roller tracks and splitter boxes were installed to protect and hide aircraft in the forest, covered with nets. A number of these splitter boxes have been preserved to date. On 15 August 1944 the Americans bombed Twente airport with 75 B-17s. On 17 March 1945, the Americans bombed Twente airport again with 152 B-17s in a big raid. The bombing raid plowed the entire field and made it unusable for flight operations. 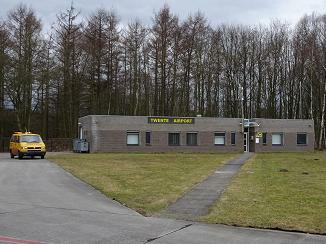 On 1 April 1945, Twente airport fell into Allied hands. The airport was repaired very quickly, and already on 3 April the first planes arrived. 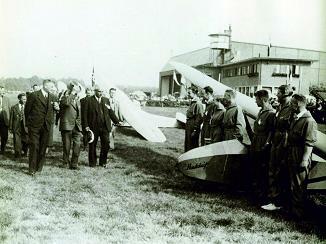 In November 1945 the airport was transferred to the Dutch authorities. A minor typo in the deed misspelled the airport name as Airbase Twenthe, with an added 'h'. The military stationed both fighter and trainer aircraft at the base. In June 1948 the jet fighter Gloster Meteor was introduced to the air force. 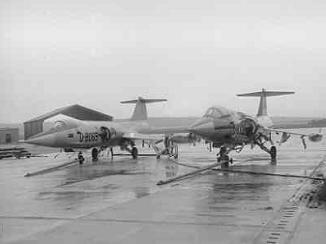 These aircraft were first placed at airbase Twenthe at the Fighter Flight School. 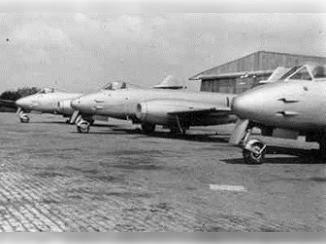 In the mid-fifties the Gloster Meteor was succeeded by the Hawker Hunter day fighter and the North American F-86 Saber all-weatherfighter. In the period 1962-1964 the Sabers were replaced by the Lockheed F-104 Starfighter. This made Twenthe the first starfighter field in the Netherlands. 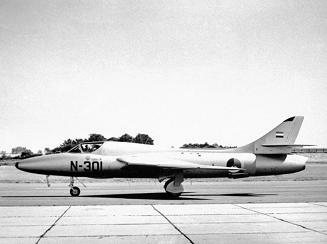 In 1969 the F-104s were succeeded by the Northrop NF-5. For the 315-Squadron, the F-16 era began at Twenthe in March 1986. The first F-16 for the 313-Squadron landed on Twenthe on 13 June 1987. On July 1, 1988, the last 313 NF-5 flight was made from Twenthe. Due to budget cuts the 315-Squadron was dissolved in 2004. 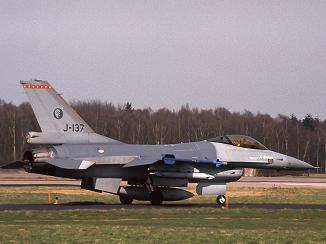 The F-16s were partly sold and partly divided over the last two F-16 bases Leeuwarden and Volkel. The last F-16 squadron (313) was transferred from Twenthe airbase to Volkel airbase in November 2005, but the military part of the base was used until June 2007 for maintenance, repairs and keeping the F-16s stored here in flying condition who had become redundant due to the cuts. 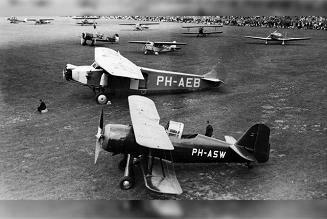 Some of these aircraft were sold to Chile that year, the rest was dismantled at Volkel. On 7 December 2007 military use of the airport ceased. As of 1 January 2008 the airport was closed for civil aviation as well, pending governmental agreement on the future of the airport. In August 2015 the Belgian aircraft recycling firm Aeronextlife expressed interest to start using the airport to scrap aircraft. 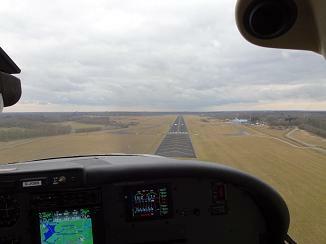 Approval was granted, and flights to Enschede Airport could resume on 1 May 2016. In November 2016 the company Aircraft End-of-Life Solutions (AELS) took over the permit for the dismantling of aircraft from Aeronextlife. The airport officially reopened on 30 March 2017 under name Twente Airport, without the misspelled 'h' from 1945. Business flights were allowed from Monday to Sunday, and light general aviation planes from Friday to Sunday. Also the local glider club may be active during the weekends. After we paid the landing fee we went back to the plane. We were going to be the last plane to visit Twente that day, and the airport operator would call it the day after our take-off. After take-off we said good-bye on the radio. We followed a route along the Twente canal to Zutphen. From there we followed the IJssel river to the south to Doesburg for some sightseeing, and then headed back to Teuge. After landing we left the plane at the maintenance company.